JAMAICA'S touring football team stormed back into the favour of the local public this afternoon, when they fashioned an impressive 3-1 victory over a strong South Trinidad side at Apex in the island's deep south, some 60 miles away from the capital. A crowd estimated at 1,500 fans saw the best game of the tour so far, with Dudley Smith consistently dangerous on the right wing, and Anthony Hill who led them, gave a brilliant display of shooting. All three goals were beauties and at least two of them which were scored by Hill will live long in the memories of those who saw them. The first came in the eighth minute as Hill collected a pass near mid-field, rounded the shadowing stopper centre-half and let fly from 35 yards. It was a great shot that dipped under the bar and zoomed into the net. Obviously, Solomon Atherley, in goal, expected him to make a pass and so jumped too late to save. Hill was so far away that Atherley was justified in believing that only Sputnik could have had the speed to get into the goal orbit from such a distance. The South equalised [illegible] minutes later. Then came the goal of the match: again near mid-field. Lue gained possession, passed to Hill. Hill switched to Bartlett, Bartlett left backheeled to Hill, each move being made without a moment's hesitation and taking the ball nearer the goal. Hill again got clear of centre-half Aldric Lowe and scored. One could practically hear the spontaneous groan of ecstasy from the crowd. All three inside men had moved in a dazzling pattern of quick interchange that baffled the defence leaving it raw and wide open. That was in the 28th minute of the first half. The third goal came from Smith who, sent away by Chevannes, cut in, switched to Bartlett who having speedily interchanged, collected the pass from Smith on the wing and returned it on a platter for Smith to move across and shoot strongly with his left foot in the 20th minute of the second half. However, that was the brighter side of the picture; as I said before, this was the best match of the tour to date and territorially, play was pretty even in both halves. Actually, South were unlucky not to have scored in the very first ten seconds when kicking down. They reached the Jamaican goal without one visitor touching the ball. With only Williams to beat, Bob Dewar who led the attack, shot weakly even if admitting Williams had run out desperately, in cutting down the angle. The ball hit the upright and rebounded into play for Ed Turton cutting in from outside right to miss from what looked like eight yards. Lowe at left back was having his hands full with Ed Turton, Trinidadian Olympic sprinter, who was beating him in the first half to through passes. At times, the Jamaica defence was overrun, but Franz Alexander who was surely playing one of the best games of his life repreatedly broke up dangerous attacks. However, the twelfth minute of the first half saw the equaliser when two corners came in quick succession, bot through right wing and Delbert Charleau who led the side picked up a strray ball in the area from the second corner and scored. Jamaica had chances towards end of the half when Miret had only the custodian to beat but failed twice and the score ended 2-1 in favour of Jamaica. For one terribly long spell in the second half, South bombarded the Jamaican goal with play now [illegible] to the left wing where Sonny Pope and inside man, Alvin Corneal made things unhappy for Chevannes and Largie with their fine understanding and accurate passing. In that spell, both Alexander and goal-keeper Kenny Williams, played grandly as corner after corner were forced. 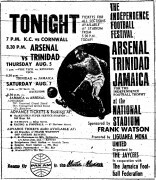 The Jamaican goal led a charmed life; once left-half Haynes snapped up a throw-in and shot first time only to see the ball ricochet off the cross bar. However, the pressure eased and Alexander reimposing control, so rattled Dewar that Ed Turton switched to centreforward in a vain attempt to renew the grip. One thing that heartened the Jamaicans was the flowing of the forward line; Smith had nullified the speed of the defence by interchanging quickly instead of sprinting down the wings, then accepting through passes at the inside right position. Hill was distributing the ball like a master and none was holding the ball, thus infusing a fluidity that often baffled the Trinidadians. The important fact was that the field was like a billiard table, fast and hard and the visiting forwards, revelled in such conditions. Fortunately for the South, Dennis Turton was splendid at right back although the whole defence was eral sound. Prior Jones refereed the game. The teams were presented to Mr. Jack Mowl, General Manager of the Apex Trinidad Oil fields.